Cases are constructed of heavy chipboard covered in black leatherette and filled with a fine polyester filling, the lid is fixed with pins inserted into the sides of the case, the pins and lid are easily removable for loading collectables. Save money by ordering full cartons of each size. 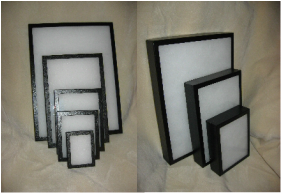 Display Mount Size: 2.5 x 3 x 1"
Display Mount Size: 8 x 12 x 7/8"
Display Mount Size: 8 x 12 x 2"
Display Mount Size: 14 x 8 x 1"
Display Mount Size: 12 x 16 x 7/8"
Display Mount Size: 12 x 16 x 2"
Display Mount Size: 6 x 8 x 7/8"
Display Mount Size: 6 x 8 x 2"
Display Mount Size: 5 x 6 x 7/8"
Display Mount Size: 4 x 5 x 7/8"
Display Mount Size: 3 x 4 x 7/8"